Love’s playoff averages: 18.4 points, 10.9 rebounds and 44.9 percent shooting from three-point range. He appears to be fitting in quite well now with the powerful Cavaliers. When the Cleveland Cavaliers — led by returning superstar and, if you are of a certain mind, de facto general manager LeBron James — made 2014 No. 1 overall pick Andrew Wiggins the centerpiece of a trade with the Timberwolves for Kevin Love two summers ago, they figured they were getting a rebounding, three-point shooting machine who would fit perfectly with James and Kyrie Irving. For most of two seasons, though, the narrative has been much different than that. Last year, Love struggled to fit in both on and off the court — a tension that was real. He was injured during the playoffs, but the Cavaliers made it to the finals anyway — prompting some to wonder (myself included) if the two sides might be better off cutting ties. It was bad enough this season that trade rumors involving Love persisted through the winter. The coaching change from David Blatt to Tyronn Lue was supposed to benefit Love, but the immediate returns were mediocre at best. In short, it was looking for much of the past two seasons that the Timberwolves got the better of the trade — and by a fairly significant margin. 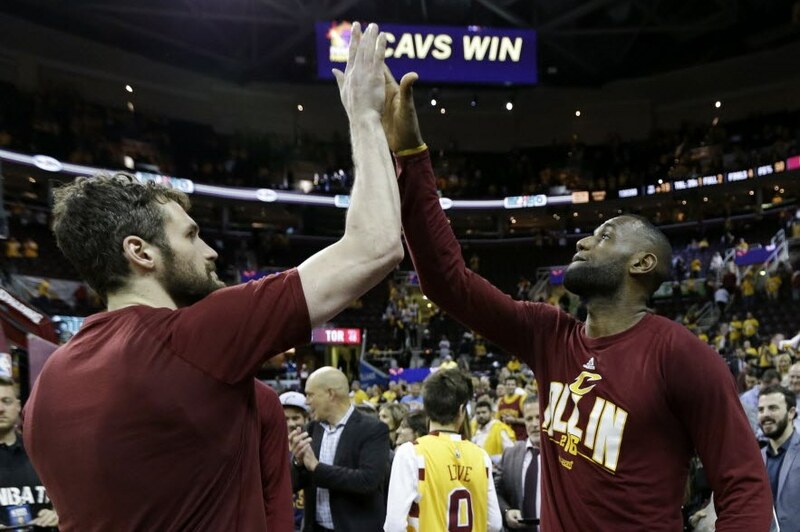 It’s only fair to note, then, that the version of Love the Cavaliers (and frankly most of the rest of us) expected from the outset of his tenure in Cleveland has emerged consistently at just the right time. Love has been a major part of the Cavaliers’ playoff dominance, a team roll that has them 10-0 this postseason and looking like they will be a formidable foe for whomever comes out of the West. Love’s playoff averages: 18.4 points, 10.9 rebounds and 44.9 percent shooting from three-point range. He had double-doubles in every game of the conference quarterfinals and semifinals; in the conference finals so far against Toronto, he hasn’t had to play more than 31 minutes in either game because they’ve been so lopsided. When Love is making more than three triples a game and shooting with such accuracy while still crashing the boards, he’s a force — and, as Cleveland had hoped, the perfect complement to Irving and James. And the trade of two years ago — particularly if the Cavs are able to give Cleveland an elusive championship — once again looks like it did at the outset: a deal that helped both teams. The Wolves got a centerpiece player for the future. The Cavs completed a Big Three in the present.